A drama and thriller with some horror elements, Flatliners offers an intriguing premise and proceeds to bungle it with wayward execution. At a prestigious medical school, Nelson (Kiefer Sutherland) is a student obsessed with exploring the death experience. He convinces his friends and classmates Rachel (Julia Roberts), David (Kevin Bacon), Joe (William Baldwin) and Randy (Oliver Platt) to participate in flatlining experiments, killing themselves with electric shocks for a few minutes before being revived with a defibrillator and CPR. Nelson goes first, followed within days by David, Joe and Rachel, with each student prolonging the death stretch ever longer. The troubling visions they experience during their brief deaths are derived from their past and present lives, and continue to haunt them in the days after the experiments. Nelson, David and Rachel encounter figures from their childhoods, while the womanizing Joe confronts the consequences of his selfish actions. Directed by Joel Schumacher, Flatliners is most notable for featuring a good collection of up-and-coming talent in the form of Sutherland, Roberts and Bacon. Despite the lack of adequate character depth, the often pouty star potential is potent, their hair carries flowy vestiges of the 1980s, and they collectively improve the film's otherwise ragged watchability factor. The proposition around keen young medical students with Nobel Prize stars in their eyes eager to make a name for themselves by experiencing death and living to talk about it from a scientific perspective has the basis for a good film. Unfortunately, Schumacher and scriptwriter Peter Filardi lose their way early. Schumacher goes for a faux gothic aesthetic featuring gargoyles and a spooky old building under renovations where Nelson and his group set up shop to conduct their experiments. The decision to steer the film towards horror-lite territory is questionable, and displaces what was proclaimed as an intellectual pursuit. And so the students one by one undergo the flatlining experience in increasingly repetitive scenes, and not once does Nelson follow through on his initial scientific quest to question, explore or discuss what it all means and where does science go with the visions experienced during death. It is ironically left to sceptical and secular David to figure out some semblance of how to beat back the diabolical threats haunting the students after they return to life, in what proves to be a most tepid resolution about the need to seek absolution by confronting past misdeeds, real or imagined. Flatliners claims to seek inventive ideas, and ends up with lukewarm guilt leftovers. I too wasn't impressed and thought that for a psychological thriller-horror, it just wasn't potent enough. The horror elements added very little to the film, amd mostly just got in the way of what could have been a good story. it's interesting how you find the horror aspect to be a hinderance to the film, and yet I find that this wasn't scary to make it more intense and frightening. 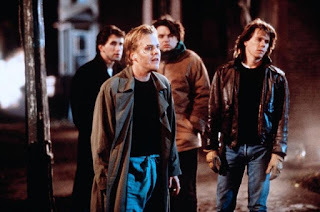 but we can agree that Flatliners didn't live up to its potential and that the '80s brat pack billing amounted to very little.